This is another game that crosses the line between Board Game and Role Playing Game, so I was debating not reviewing it, and leaving it for “This is How I Roll,” but just because it has no board and requires its players to act out roles doesn’t mean it’s wrong for this column either. For one, it comes in a box. 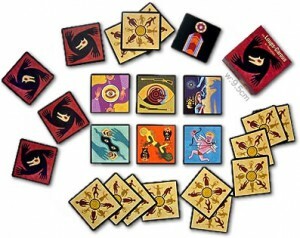 For two, a board game, while generally defined by having a board, can be extrapolated into simply being a party game – which this is. 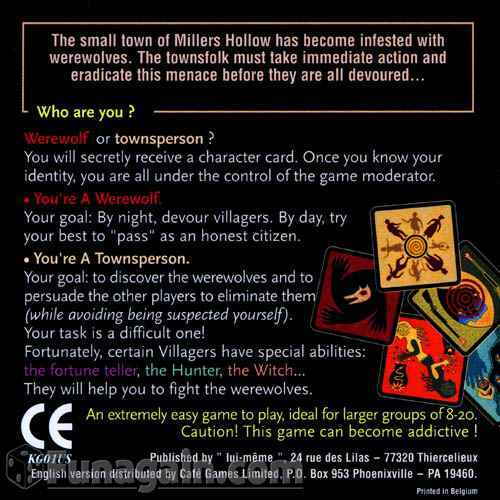 Werewolves of Millers Hollow is the game that my friend carries around almost all the time, in case she’s at a boring party and wants to have some fun, or even for an impromptu game to kill some time; this is really a formalized version of the party game “Mafia”, which can be played with just a regular deck of cards. It revolves around the players being either a killer or a townsperson, and the townspeople trying to find the killer(s) before everyone dies. Here are some things to keep in mind when deciding if Werewolves of Millers Hollow is right for you. Setting up is super easy! Pick out the cards you want to play with, having at least one werewolf card, and hand them out! You have a Storyteller who starts the game by announcing that someone has died, someone who is not one of the players. The players then get a round to decide who they think is there werewolf. If they come to a decision, they lynch that person, who reveals their card. After either a lynch, or no lynch (if the town can’t come to a decision or votes no-lynch), it’s night. After a long day of lynching, the townspeople can be super tired, so they sleep (i.e. : the players actually close their eyes*). The werewolves, however, are nice and awake and ready to kill a townsperson. They wake up and pick someone to die (though if they don’t come to a consensus, no one dies). Then if there are any other special cards that wake up during the night (such as the witch**) they wake up, and perform their action for the night). Morning comes, and someone is dead. Sometimes two people. Sometimes more (sometimes everyone***). Now the town must again vote for who is a werewolf, and play repeats until either the town wins, or the werewolves win. The Town Wins when all the werewolves have been lynched. Other win-scenarios exist, such as the case of the lovers, who win if both of them survive. 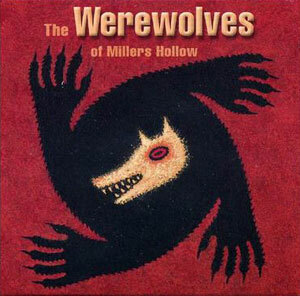 Werewolves of Millers Hollow is not a long game, but no game ever plays out the same way twice. It does have a bit of a learning curve, and can take anywhere from 3 to 5 games for people who are not familiar with the game, to understand the rules and get into it. Some people may be turned off by the fact that, in essence, they can play this game with just a regular deck of cards. Speed: Depends on your group, but generally quick. Fun Factor: High, unless you’re the type that takes getting lynched in a game personally. In the end, what matters most is the type of game you’re looking for: This game isn’t that expensive (you can find it for around 10 bucks on amazon.com), and there’s a new expansion pack! There are no points, but there is definitely a group of winners and losers, which is great for people who are competitive, and people who like team-work. There is also Ultimate Werewolf: Ultimate Edition, which was created by someone fed up with the rules of other games of these types. I have no opinion of this game, not having played it, but in the thread where I read about it, the creator sounded really cocky which instantly makes me want to hate his game. However, if you’re looking for something more in your Werewolves of Millers Hollow experience, you should probably check it out. Finally, if you’re ever at conventions, you may think I’m talking about Are You A Werewolf which is pretty much the same thing, but only uses two Werewolves, one Seer, one Moderator, and 12 Villagers at most, making the game more basic. There is, of course, nothing wrong with this, and if you’d rather have a less complicated rulset, with fancier cards than just playing cards, you should definitely check it out. *We also have them make noises so they can’t hear someone “pointing their arm” as one of my friends put it. **The Witch has the ability to save or kill someone. We do this by having the witch point to someone, and giving a thumbs up to save them (which means that if the werewolves targeted that person to die, The Witch will save them from death) and a thumbs down to kill them. We used the Cupido card, who picks two people to be lovers. Those two people now only care about each other winning the game, so they will never vote to lynch that person, and a werewolf will never kill them during the night. If, however, one of the lovers were to die, the other one kills themselves. We used The Witch card, who has the ability to kill or save someone during the night, The Sherriff Card, which grants the person two votes to lynch (or not) instead of one, The Hunter card, who, when killed, can choose to shoot and kill someone as their final action, The Little Girl, who can open her eyes and peek on the werewolves (though if the werewolves catch her spying on them, she dies in fright instantly), and The Fortune Teller, who, once per night can pick a person to find out what role they are. The Townspeople were The Witch, Little Girl, and Cupido. The Werewolves were The Hunter, The Fortune Teller, and The Sherriff. Cupido (not knowing anyone’s roles) chose the two people playing The Hunter and The Fortune Teller to fall in love. After a vote of No Lynch, the first night came. The Werewolves chose to kill a townsperson (our friend Milosz) who was The Little Girl. The Witch chose the kill The Hunter. The Fortune Teller found out who was Cupido. In the Morning, The Little Girl was dead. The Hunter (who can kill someone when they die), ended up killing The Witch. The Fortune Teller, being linked with The Hunter, killed himself. This left The Sherriff and Cupido. Clearly, The Sherriff, using two votes, lynched Cupido, winning the game for the Werewolves. ****Unless you’re Milosz who always ends up being The Little Girl for some reason. I've always considered buying this game. But, Zombie Fluxx has become our default game of choice.